Ever wondered why the air feels more invigorating and you feel fresher when you are at a waterfall or in the mountains? 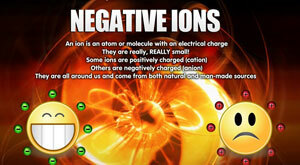 This is due to the abundance of "feel good" negative ions in the air. Research has confirmed the beneficial effects of negative ions on living things - plants grow faster and healthier, animals are calmer and perform tasks better, and humans become less stressed and more alert. Negative ions have been found to facilitate the delivery of oxygen to cells, which stimulate bodily functions and rejuvenation. They also increase the flow of oxygen to the brain; resulting in higher alertness, decreased drowsiness, and more mental energy. Studies have also shown that negative ions help to lift mood, alleviate depression and stimulate the body's reticuloendothelial system: "a group of defense cells in our bodies that marshal our resistance to disease". Since 1858, in Lourdes, a small town in south-western France, many people have claimed that aches, pains and illness miraculously disappeared after dipping into a spring, now known as the famous "Holy Spring of Lourdes". 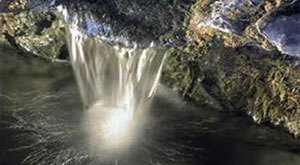 Scientists have attributed the spring's healing properties to its high content of Germanium. One of the most fundamental properties of Germanium is its semi-conductivity, i.e. its ability to donate and receive electrons easily. Many of Germanium's healing properties may be due to this intrinsic electronic quality. Coupled with its ability to neutralize the effects of positive ions that can impede the smooth flow of energy, Germanium is able to facilitate the flow of the body's bio-energy, hence, increasing energy levels, and relieving pain and stiffness.